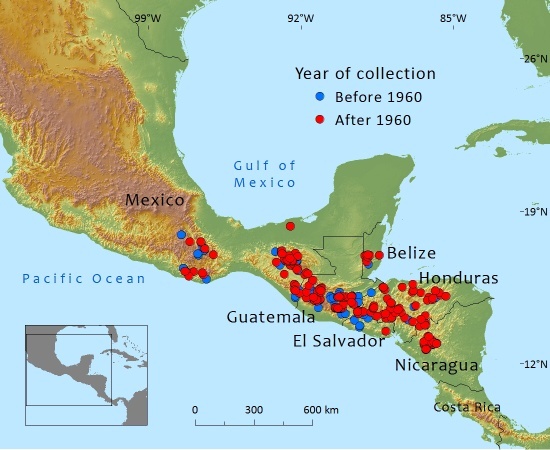 Distributed in Central America in Southern Mexico: Oaxaca & Chiapas; Belize; Guatemala; Honduras; El Salvador and Nicaragua. While still extensive in its range, subpopulations have dwindled in many locations in terms of mature trees. Several of these are fragmented in the sense that in some localities only a few trees are left from what was formerly a substantial number, and these are now isolated from similar stands. Moreover, the Mexican subpopulations are a long distance from the main EOO in Central America. The altitudinal range of this species is considerable varying from (300–)550–2500(–2900) metres above sea-level; in Belize it is found between 300–760m. It is a major constituent of more or less open to closed-canopy pine and pine-oak forests in climatic zones which receive at least 1000mm of rainfall per annum, and up to 2500–3000mm in some places. The dry season is usually long, lasting from November to May, so that at lower to middle altitudes fires are an integral phenomenon in the ecosystem, the frequency of which has been however greatly accelerated by humans. Here, open pine stands with grasses, Pteridium aquilinum, Rubus, Calliandra, and Leucaena are predominant as long as the disturbances do not lead to further degradation. In less disturbed areas, mostly at higher altitudes, P. tecunumanii is often associated with other pines, such as P. oocarpa, P. maximinoi, and P. pseudostrobus, and at the more mesic sites P. ayacahuite and P. chiapensis. Abies guatemalensis and Cupressus lusitanica are other conifers on these high mountain ridges. On the Atlantic slopes in Chiapas a mixed angiosperm forest with Liquidambar, Magnolia, Clethra, Carpinus, Symplocos, Quercus and many other species predominates, and Pinus tecunumanii and other pines occur either on poorer sites or at an earlier stage in a sere leading back to dominance of broad-leaved trees. Pinus tecunumanii is an important timber tree in Central America, where it can grow a straight bole with large dimensions. It is largely exploited for sawn timber and other local wood products in its native range; potentials for wood pulp production are considered to be high if it was to be grown extensively in plantations. This taxon has received considerable interest from foresters as a species for potential plantation forestry to be introduced in tropical countries. A comprehensive collection of seed and specimens was carried out by the Oxford Forestry Institute (OFI), as well as by other organizations, throughout its entire range. A major limitation to introductions on a large scale is the limited availability of seeds, both from natural stands and from so-called seed orchards. It has been planted as a forestry tree in Africa, India, South America and Australia (Queensland). It is not known to be used as an amenity tree. Past and recent exploitation has led to a decline of up to 40% within the last three generations. The area of occupancy has been reduced to less than 2,000 km2. While there are more than 10 locations, the subpopulations are thought to be severely fragmented due to logging and conversion of forest lands to other uses. Exploitation is ongoing: if it continues at the same rate as in the recent past the overall decline is likely to exceed 40% within the next generation. Taken together, this indicates an assessment of at least Vulnerable under the criteria for A2, A4 and B2. While occasionally still abundant and of very tall stature, this pine is now usually scattered in small, disjunct subpopulations and has been depleted by overexploitation and forest clearing, especially at lower elevations, to such an extend that many of these subpopulations are now vulnerable to extinction (Dvorak & Donahue, 1992). This species occurs in a number of protected areas, but in several of these there is little effective control of (illegal) logging. Cordero, J. & D.H. Boshier (eds.). (2004). Pinus tecunumanii Egiluz & J. P. Perry. Pp. 771-774 in , Árboles de Centroamérica. UK: Oxford Forestry Institute (OFI) and Costa Rica: Centro Agronómico Tropical de Investigación y Enseñanza (CATIE). Dvorak, W.S., G.R. Hodge & Romero, J.L. (2001). Results of twenty years of research on Pinus tecunumanii by the CAMCORE Cooperative, in Forest Genetic Resources No. 29. Dvorak, W.S., G.R. Hodge, E.A. Gutiérrez, L.F. Osorio, F.S. Malan & Stanger, T.K. (2000). Pinus tecunumanii. Pp. 188-209 in Conservation & Testing of Tropical & Subtropical Forest Tree Species by the CAMCORE Cooperative. Raleigh, NC: College of Natural Resources, NCSU. A.Farjon, 2016. Pinus tecunumanii, from the website, Threatened Conifers of The World (http://threatenedconifers.rbge.org.uk/taxa/details/919).